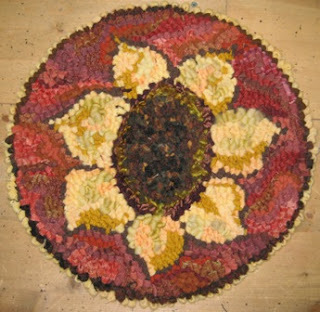 DEANNE FITZPATRICK PATTERNS ! ! ! 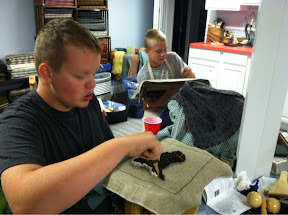 Thirteen year old grandsons, Luke and Jakob, stayed all night and today they are learning to hook! Help me!!! Two posts in one day is unusual to say the least ~ but had to share the boys at work! 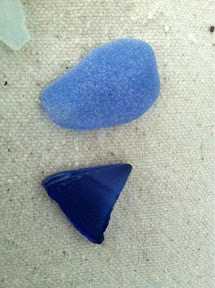 We went beach glass hunting in a new place on Saturday morning at 7 a.m. ~ woo hoo! Thanks to lake friend, Margo, for the info!!! Lots o' glass! Oh ~ the stick separates his from mine ~ one of us is a little competetive as to who got more! Just saying ~ I found 37 lucky stones that day!!!!! 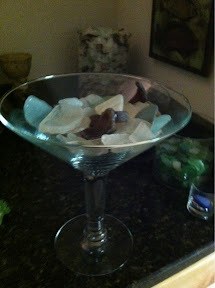 Filled a new extra large martini glass (from Hobby Lobby) with some of the big chunky ones!!! We found this teepee someone started and Sonny added a couple new logs to it! Hope it's there next time we go!!!! We hunted for four hours ~ so peaceful listening to the waves ~ it was a great day! Then we went to dinner at Brandy's with lake friend, Margo and her husband ~ then to their house for black Russians to top off the evening! Days like that make up for the ones that aren't quite so much fun! Hope your day is fun today! Two weeks since I've posted! I have been having fun, for sure ~ and I've been BUSY!!! This is one of the pumpkins I've been hooking! Here are a couple more! Small projects for my Sauder class! Only 16 in total ~ 12 more to do! I took four grands to lunch and errands ~ that was fun!! This was after they all had their glasses on upside down! I'm sure the surrounding patrons wondered where I picked up this little band of wild and crazy kids!! I went to Indiana to visit my friend, Gwen ~ and while there, I learned to knit! This is almost done ~ there's just a few inches left to do ~ I ran out of yarn and the gal sent it to me right away ~ but I lost momentum. I'll get it back though ~ I can finish it in short order ~ then block it ~ and wear it around my shoulders on a nice cool evening! 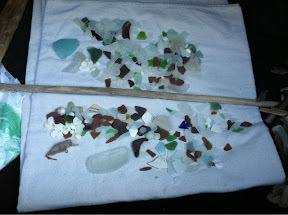 We've collected lots of beach glass ~ this was from a couple of weeks ago. Friday, we went to a place further away from us and collected a lot! Then we met friends at Crush Wine Bar in Sandusky and had a little bite and a beverage!! 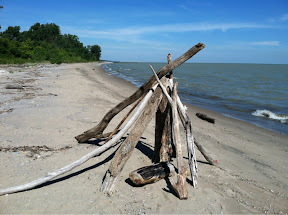 On one of our beach walks, we found this ~ a fun little memento that someone left from their fun day at Lake Erie! This little bracelet is made entirely of stones we found on the shores of Kelley's Island ~ the day we missed two ferry boats because we just weren't quite ready to quit! I think it's very sweet and dainty ~ unlike the maker!! And we've seen beautiful sunsets ~ we had to pull off the road to get this ~ if we had waited till we arrived at the condo ~ which was not far ~ it would have been too late! Lots of other things have gone on, too. But these are the fun ones ~ the things that get us through all the hard work and challenges that life brings! We're having as much fun as we can ~ I hope you are, too! 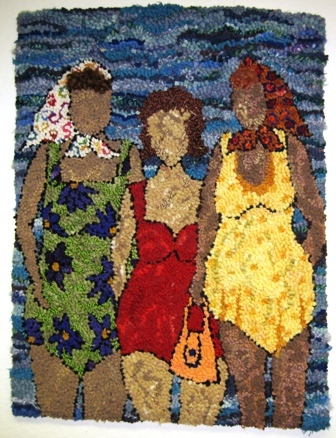 These are just a sampling of the new Deanne Fitzpatrick patterns that just arrived!! Wish I had them for the hook-in last week but they're here now and they're fabulous!!! This one is Bathing Beauties ~ and they are!! Chairpads are all the rage right now! Goin' Shopping is the name of this little mat! Good gift for a girlfriend! 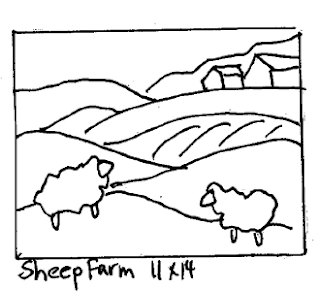 Love this sweet little Sheep Farm rug, too! 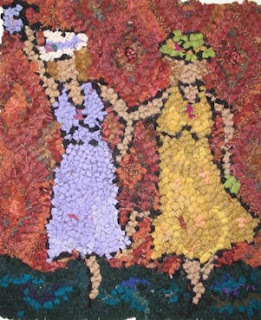 Check my website Folk Art Primitives and click on the patterns link to Deanne's patterns and you'll see the new ones along with sizes and prices! Email me to order ~ gfraizer@neo.rr.com .